HIGH BRIDGE — Mayor Bill de Blasio distanced himself Sunday from two businessmen embroiled in a federal corruption probe of the NYPD that has expanded to his campaign fundraising practices, saying that he doesn't know the men that well and that his campaign is returning donations from both. "It's not a particularly close relationship," the mayor said of his ties to businessmen Jeremy Reichberg and Jona Rechnitz. "I met them first around the time of the general election. I hadn't know them previously, really haven't seen them in the last year or more." The NYPD has stripped two high-ranking officers of their guns and badges and transferred two others amid an FBI investigation into whether the officers accepted cash, gifts and international trips from Reichberg and Rechnitz. Both businessmen were on de Blasio's inaugural committee. Rechnitz and his wife contributed $4,950 each to de Blasio's 2013 mayoral campaign. Reichberg raised $35,000 for the Campaign for One New York, a nonprofit group connected to the mayor that accepted money from groups with business before the city to accomplish de Blasio's political goals. The expanding federal probe is examining whether the donors to the Campaign for One New York, which has since been disbanded, received special treatment, sources said. 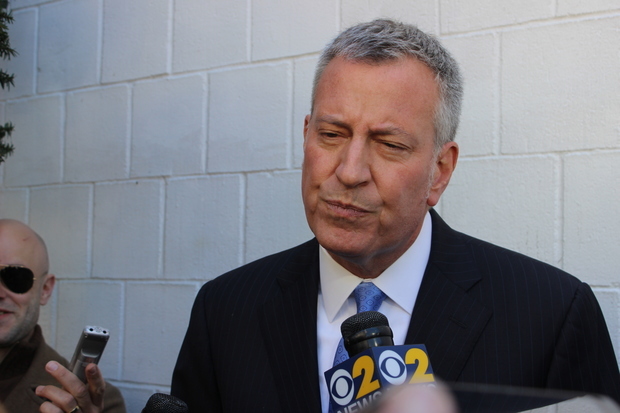 After stumping for Democratic presidential candidate Hillary Clinton at the Latino Pastoral Action Center in The Bronx Sunday afternoon, de Blasio said he was not aware of any federal investigation into his fundraising activities. "I have no evidence of that fact. We have gotten no inquiry from any office and no one associated with me has gotten any inquiry, so I just can't comment on something I have no specifics on," de Blasio said. Last week, de Blasio said he would wait for the outcome of the federal investigation before deciding to return campaign donations from the two men and that he would not take any of their donations for his 2017 re-election campaign. Asked why he had now decided to return the men's donations, de Blasio said he was prompted to act after the NYPD internal affairs probe had progressed "to a point where they have enough evidence for the disciplinary actions taken against the officers." "That's what made me decide we should go the only other step we have, which is to return the 2013 donations," de Blasio added. Asked about the role of the two men on his inaugural committee, de Blasio said they both just "supported the effort." Neither Reichberg nor Rechnitz has been charged with any crime. "We are fully confident that the campaign has conducted itself legally and appropriately at all times," said de Blasio campaign spokesman Dan Levitan. A spokesperson for U.S. Attorney Preet Bharara declined comment. The Campaign for One New York and United for Affordable NYC announced they would close last month after good-government and tenant groups questioned whether the organizations, which can take unlimited amounts of money and are not required to report donors or what the money was spent for, were violating campaign laws. In calling for an investigation, Common Cause said the practice "blurs the line between campaign activity and the Mayor's function as the head of New York City government" and "raises serious questions about who has influence and access to the policymaking process." De Blasio said the Campaign for One New York would not be returning any money Reichberg raised. "The Campaign for One New York doesn't have any money in it. They spent all their money and are shutting down," de Blasio said. As part of the joint investigation with the NYPD and the FBI, Deputy Inspector James Grant, the commanding officer of the 19th Precinct on the Upper East Side, was placed on modified duty and stripped of his gun and badge, as was Deputy Chief Michael Harrington, who was second in command in the NYPD's citywide housing bureau. Deputy Chief David Colon, the Commanding Officer of the department's Brooklyn Housing Bureau and Deputy Chief Eric Rodriguez, who was the executive officer of Brooklyn South command, were transferred. In another related federal probe, Bronx restaurateur Hamlet Peralta is accused of stealing money from one of the businessmen embroiled in the NYPD probe as part of a $12 million Ponzi scheme around a fake wholesale liquor deal.